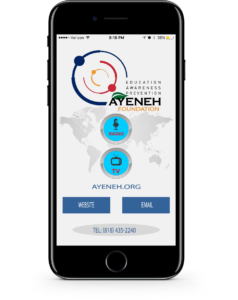 The Ayeneh Foundation is excited to announce the launch of our mobile application for iPhone and Android devices. Our app allows you to tune into our Live Radio Broadcast and view our Live TV Broadcast from the comfort of your mobile device. Use the buttons below to download the app on your device today!